For the thousands of students who take on the weighty task of choosing a university, the decision often comes down to more than just the school’s reputation and cost. Natural and architectural aesthetics are also considered, and rightly so. If it’s true that man is inspired by beauty, then it makes perfect sense to attend a university where you can be literally surrounded by it, and we just happened to have made a list of places where students can do exactly that. The 30 universities on this list are the most beautiful in all of Canada. They are located throughout the country, and include both English- and French-speaking institutions. Award & Recognition: Whether national or international, any recognition a campus has received played a large part in its placement on our list. In general, the larger and more recent the honor, the higher the university was placed. Number of Notable Features: Campuses with more than one significant or celebrated building or feature was ranked higher than those with a single notable feature. Student Enjoyment: It’s true that general aesthetics can be enjoyed by both visitors and students and faculty, so those universities with features able to be enjoyed by the student body (such as botanical gardens or hiking trails) were given higher priority. Other: Those campuses with other notable characteristics, such as historical significance or environmental friendliness, were also considered. In the event of a tie, the higher-ranking campus was chosen by the author based upon such things as historical significance, academic reputation, and natural terrain and climate. University of Regina’s historic campus has a long history during which its buildings were used as training facilities during World War II, a natural history museum, and a teacher-training facility, among other things. Today, the campus is a collection of traditional-style buildings revolving around an iconic circular green quad. The university’s list of most notable buildings include the Dr. John Archer Library, the Research & Innovation Centre, and the Regina Research Park. There is something inherently romantic and beautiful about the campus of University of Prince Edward Island. Taking up 54 hectares of land, the campus includes a number of historic buildings including the Main Building (constructed in 1854) and the Dalton Building (constructed between 1917 and 1919), both of which appear on the Historic Places of Canada registry. Students can enjoy the campus’s main quad, or take a walk on the Confederation Trail, which runs along the easternmost side of the university. 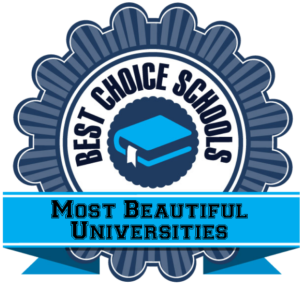 Next on our list of the 30 most beautiful colleges in Canada is Memorial University of Newfoundland’s main campus. Located in St. John, NL, the quiet campus is located next to a large park in an even larger residential area. Such a peaceful environment extends to the campus itself, which boasts plenty of green space for students to enjoy, tree-lined walking paths, and even a pond with a dock. Université de Saint-Boniface is another of Canada’s beautiful urban campuses. Located on Avenue de la Cathedrale in the heart of one of Winnipeg’s most desirable neighborhoods, this French-language university is certainly a peaceful and beautiful place to spend time as a student. A number of grand historic buildings grace the campus, including the Tyndall building, an amphitheater, a chapel, and the Étienne Gaboury student center. Students here have their pick of the many amenities that surround the campus, such as local cafes and restaurants, lots of shopping, a local public market, and pretty views of the Red River. The stylish and modern campus of Grant MacEwan University is one of the most unique on our list. Three groups of concrete spires, plus a giant public clock, greet visitors and students as they enter campus, while the rest of the structures, each built in a modern but unique style, stretch from east to west. Especially notable buildings on the Grant MacEwan campus include the MacEwan Residence and the state-of-the-art Christensen Family Centre for Sport and Wellness. Old meets new on University of Ottawa’s beautiful urban campus. Nestled amidst skyscrapers in Ottawa’s Sandy Hill neighborhood, the 35-hectare campus is home to a number of impressive buildings. 100 Laurier, built in 1893, remains the university’s oldest building and complements in style buildings such as 120 University, constructed in 2012. Also impressive are the various buildings’ many architecture details, such as the Social Science building’s “green wall,” or tallest living biofilter on the continent. Though Simon Fraser University has two campuses, we are especially impressed by its Burnaby campus. Perched atop Burnaby Mountain in British Columbia, the campus’ most recognizable feature is The Academic Quadrangle and its surrounding interconnected buildings. Within the quadrangle is a garden and impressive water feature. Other notable campus buildings include Blusson Hall, with its many windows, and the W.A.C. Bennett Library. Beautiful Université de Montréal is perhaps one of the most iconic and recognizable universities in Canada. Situated on the northern slope of Mont-Royal, the campus has been carefully constructed around its centerpiece, the Pavilion Roger-Gaudry. This Art Deco-style tower was designed by the famous architect Ernest Cormier and towers above a collection of additional modern buildings. Beautiful University of Windsor is stuck between two very different lands — literally. On one side is the American city of Detroit with its busy port of entry, while on the other side are the residential neighborhoods of Windsor. Many of the buildings on the 51-hectare campus offer views of the Detroit skyline and the famous Ambassador Bridge, though other parts of the campus are much quieter. The campus is home to a small arboretum, which proudly contains many of the species to be found in the Carolinian forest. Since 1996, St. Francis Xavier University has undergone an extensive $230 million renewal program that has unmistakably secured St. Francis Xavier University as one of Canada’s most beautiful college campuses. Such notable and beautiful new buildings include Riley Hall and O’Reagan Hall, each designed for LEED Gold efficiency, the state-of-the-art Frank McKenna Centre, a brand new track and field, and the Charles V. Keating Millennium [conference] Centre. University of Waterloo has four campuses throughout the province of Ontario, all of which could probably have their own spot on our list of the most beautiful colleges in Canada. The main research campus in Waterloo is situated on 400 hectares of former farmland, and lots of green space still exists in between the many state-of-the-art research facilities. Meanwhile, Waterloo’s Health Sciences Campus, located in Kitchener, and its Stratford Campus are much more modern in their architecture styles. And finally, our favorite of Waterloo’s buildings: the School of Architecture, located in Cambridge. The riverfront campus is located in one of the city’s most historic neighborhoods, in a historic brick building that has been fitted out in a modern style. Calgary, Alberta’s Mount Royal University is chock full of appealing details that combine to create one of Canada’s most beautiful college campuses. For example, its many green spaces and gardens provide the perfect study spots, while there’s no better place to enjoy a play or concert than the outdoor amphitheater. And Mount Royal’s campus isn’t just beautiful, it’s also environmentally friendly. It’s first certified LEED building opened in 2006, and since then the school has vowed to make every new building an LEED-certified building, too. Described as a “city within a city,” University of Manitoba’s main Fort Garry campus is situated in the u-shaped bit of land formed by Winnipeg’s Red River. The 280-hectare campus provides students with everything they need amenities-wise, though it certainly provides some appealing aesthetics as well, including a well-coordinated mix of historic and modern buildings, tree-lined walkways, and lots of green space. The 165-hectare campus of University of Guelph has so many stunning historical buildings that it was an easy addition to our list of the most beautiful colleges in Canada. Some of the campus’ oldest buildings date back to even before the modern university was founded, back to when this spot in Guelph, Ontario was the Ontario Agricultural College. A number of other notable buildings were constructed during the 1960s in the unique-for-colleges Brutalism architectural style. The French-language Université Laval takes up less than half of a square mile, about half of which is wooded area and grasslands, including the Roger-Van den Hende Botanical Garden. The garden is easily one of the most beautiful places on campus, and is home to nearly 60 different species of birds and myriad tree types. The 30 campus buildings range in style, from the foreboding Pavilion Charles-De Koninck to the traditional collegiate-style Old Séminaire de Québec. The most iconic and beautiful building, however, is almost certainly the towering Pavilion Louis-Jacques-Casault. Located an hour from Halifax, Acadia University is undoubtedly one of Canada’s most beautiful college campuses. Acadia’s home of Wolfville is perhaps the quintessential college town, though the views of the Annapolis Valley and Bay of Fundy are a pretty nice bonus. The 220-acre campus doubles as a rich natural environment, and steps from campus students will find farmlands, vineyards, and lots of woodland hiking trails. Though it looks like something straight out of a medieval fairy tale, Royal Roads was recently founded in 1995. It is located in beautiful Victoria, British Columbia on property that is part of the Hatley Park National Historic Site. While the University is relatively young, its most beautiful building is Hatley Castle, which was built in 1908 but became part of the campus upon Royal Roads’ founding. And if you think Royal Roads University looks familiar, you’re almost certainly correct. The aforementioned Hatley Castle has been used as a location for a number of films and television shows, including X-Men and Arrow. Urban campuses aren’t always known for being beautiful, but Ryerson University in Toronto is a clear exception. Located all over the city, most of Ryerson’s buildings are stunningly modern. Perhaps most impressive is the award-winning Student Learning Center, which is described as “a physical manifestation of Ryerson’s spirit.” The building’s ultra-modern exterior is all glass, while inside, large open spaces house a library, tech spaces, seminar rooms, individual study spaces, and even an amphitheater. McMaster University in Ontario is located within a residential section of the city of Hamilton — unexpected, perhaps, but the result is a uniquely beautiful setting. Running across campus are myriad pathways for pedestrians and cyclists, while connected campus walking and hiking trails make their ways throughout the surrounding area. The natural beauty continues with Cootes Paradise, the university’s wildlife sanctuary that is home to all kinds of plants and animals. Even the campus buildings are beautiful, with a unique mix of historic and modern. Take one look at the buildings on Lakehead University’s Thunder Bay campus and you’re likely to notice one thing in particular: lots and lots of windows. The buildings were designed with maximum floor-to-ceiling windows so that students and faculty to always be a glimpse away from the stunning nature on campus. The campus is situated on the shores of Lake Tamblyn, while the cliffs of Sleeping Giant Provincial State Park soar overhead. The 116-hectare campus is mostly green space, with lots of blooming gardens, and even some wildlife. From its hilltop perch, Quest University offers stunning views of a wooded valley and towering snowcapped mountains. Fortunately, Quest’s beautiful and modern campus buildings are all characterized by large floor-to-ceiling windows, from which students can enjoy these stunning views, though on a nice day, the university’s large green space is the perfect place to socialize or study. Taking up 500 acres in the Eastern Townships region of Quebec is Bishop’s University, one of the few colleges in the province which teaches mainly in English. Bishop’s University — which was one of the main filming locations for the 2006 movie The Covenant — offers its students both natural and man-made beauty. In fact, Bishop’s is lovingly referred to as the “Oxford on the Massawippi” thanks to its many Gothic Revival buildings and its situation between the Massawippi and the St. Francis rivers. University of Saskatchewan may be best known for its prestigious medical program, but we think its stunning campus is worth celebrating, too. The University was founded in 1907, and many of its original buildings are still standing and used. These campus jewels are mostly constructed in limestone and overlook the campus’s main green, The Bowl. Dalhousie University has three campuses in Halifax, Nova Scotia, and each one is absolutely stunning. Dalhousie’s traditional collegiate atmosphere is defined by its perfectly manicured grounds, stunning landscapes (including lake views! ), and historic ivy-covered brick buildings, at the center of which is a tree-lined quad perfect for a quiet study session. Situated along the banks of the Thames River in London, Ontario is Western University, known also as University of Western Ontario. This spacious campus offers a ton of opportunity for both quality student living and aesthetic pleasure. Campus buildings are a nice mix of historic and modern, and offer just about any amenity a student may need. Best of all, however, is the abundance of open space for students to enjoy everything from a study picnic in the quad to snowboarding on University Hill. University of King’s College in Halifax, Nova Scotia is a university as historic as it is beautiful. It was established in 1789, making it not only the oldest chartered university in Canada, but also the first English-language institution in the Commonwealth (outside of Britain, of course). Though the original campus was destroyed by a fire in 1920, leaving the University to take up residence near Dalhousie University, today’s University of King’s College is just as impressive as ever. Notable buildings include the stately columned Arts & Administration Building, the stone Bays (residence halls), and the chapel with its beautifully carved statues and reliefs. Though it’s spread all over Canada’s largest city, University of Toronto is an easy addition to our list of the 30 most beautiful colleges in Canada. The main part of this historic institution revolves around the stunning Queen’s Park, just one of the many green spaces to which U of T students have access. The campus seems to blend seamlessly with the city around it, which is certainly a definite plus for students in search of big-city amenities. However, the crown jewels of the University aren’t the modern conveniences, but rather the historic buildings constructed in ornate and impressive Romanesque and Gothic styles. The world-famous McGill University is located right in the midst of downtown Montreal. Despite its urban location, McGill offers its students lots of green space and stunning views of the tree-covered Mount Royal. Combine this with its impressive 19th-century architecture — like the 1843-built Arts Building, the oldest building on campus — and it’s no wonder McGill University is considered one of the most beautiful colleges in Canada. Fun fact: Queen’s University is actually older than the country of Canada! This beautiful college located in Kingston, Ontario was founded in 1841 by royal charter issued by — who else? — Queen Victoria. The campus is well-known for its beautiful limestone buildings and ornate architecture, though the fact that it’s located next to stunning Lake Ontario is pretty appealing as well. Situated a mere 20 minutes from downtown Vancouver, but surrounded by water views and mountainscapes, it’s no wonder University of British Columbia tops most lists of the most beautiful colleges in the country. While the campus itself is like its own little community, complete with all necessary amenities and tons of green space, it’s the university’s easy access to both beaches and mountains that make it really appealing.